So lets say Jacob is born to a single mom, average income around $15,000. To see how life is different for Jacob - than for say, your baby born to typical middle class parents - you actually have to rewind. Before the crying, the cooing, before he was even born, Jacob had some disadvantages. His mom probably wasn’t planning on having a baby. So, the statistics say, it’s less likely she had good prenatal care. She might not have even know she was pregnant for the first few months. It happens. So, fast forward: Jacob is born. And now he has to survive his first year, which, in Michigan, is harder than you think. 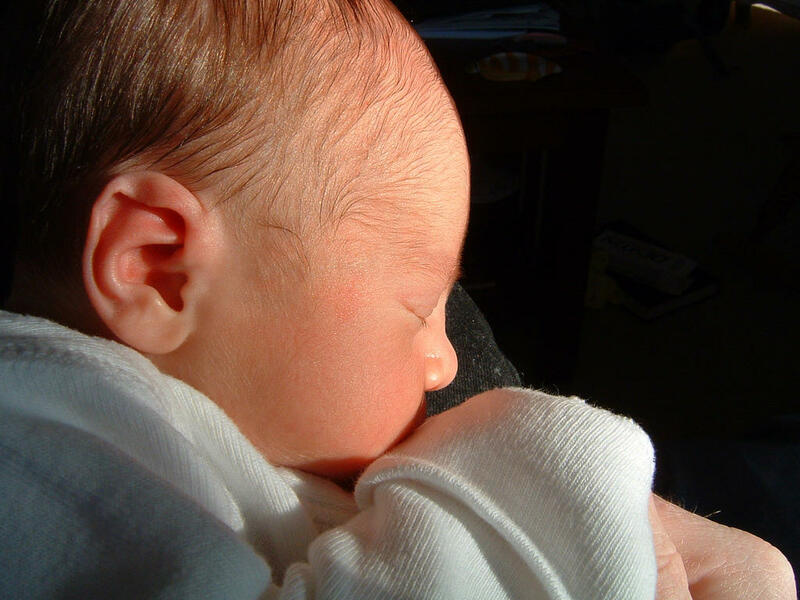 Right now – Michigan’s infant mortality rate is higher than most states. The average is 8 per 1000 babies. One possible risk factor for Jacob: let’s say his mom smoked - nearly one in five pregnant moms in Michigan smoke, according to the League. It’s one of the biggest indicators for Michigan’s high infant mortality rate. And it all goes back to what Jacob experienced in the womb - whether his mom was educated, whether she had resources, or the tools to quit smoking. Whether she could make it to all those prenatal doctor’s visits. “So it’s directly back to the well-being of the mom, the well-being of that pregnancy as being critical to the life chances of those babies,” says Zehnder-Merrell. Now that Jacob is born, though, there are some ways to help him. “If you’re talking about poverty, if you’re talking about improving the health of a population, where best to start than providing optimal nutrition that’s free,” she says. Schreck runs a breastfeeding support group at St John’s Hospital in Detroit for low-income moms. She says breastfeeding alone decreases infant mortality rates by 30 percent. And research shows that breastfeeding could help improve baby Jacob’s health and his IQ. Many women in all income groups choose not to breastfeed, for various reasons. And it may not work for everyone. But research shows that breastfeeding rates are lower for low-income and minority women. And, research shows that can have an effect on the child’s development. It’s also important to consider brain development at this early stage. In particular, language is crucial in the first years. Brain research shows that if you don’t learn language in these first few years, you’re going to struggle with it your whole life. And here again, Jacob is at a disadvantage. “What you see is that middle class children are exposed to many, many more words than working class children,” says Fabian Pfeffer, who studies economic mobility at the University of Michigan. The information on word exposure comes from a famous study, conducted in the 1990s. Two researchers - Betty Hart and Todd Risley - followed a bunch of children from both low-income homes and middle-income homes for about two years. They recorded hundreds of hours of conversation between the kids and their parents and found that,on average, kids in the higher income family heard about two thousand words an hour. Kids like Jacob heard 600 words per hour. By the time Jacob is four, we’re talking about a 30 million word gap. That’s all before Jacob even enters kindergarten. “So this is inequality in educational outcomes that has been established before they even enter schools,” Pfeffer says. The gap never goes away as Jacob gets older. If anything it gets worse. And the gap is big. Really big. That part part actually doesn’t surprise researchers. “The surprising thing is that it’s been growing a lot,” says Sean Reardon. He’s a professor at Stanford who studies educational inequality. He published a paper last year showing that the gap in test scores between the well-off kids and the not-so-well off kids has grown as much as 40 percent in the past few decades. The gap means that when Jacob gets to eighth grade, he’ll be about where the well-off kids were in fourth grade. That’s a much bigger gap than it was even just a few decades ago. And Reardon says the gap is not growing just because kids in well-off families have more money. All parents are spending a lot more money on their children than they did a few decades ago - we’re talking private preschool, ballet, summer camp. Those things pay off. So, by the time Jacob is in high school, not only is he at a disadvantage, but that disadvantage is worse than it would have been a few decades ago. The more Jacob falls behind, the more disillusioned and frustrated he becomes. And, eventually, there’s a pretty good chance Jacob will drop out. Sadly, he’s not alone. There are some high schools in Detroit, Flint and Grand Rapids where as many as a third of kids drop out and don’t graduate. Not to mention, the mountain of research that suggests Jacob is also at much higher risk for health problems, because of the stress he experienced as a child. The disadvantages just keep piling up. What can we change to give Jacob a better shot? That’s what this new project is all about, and what we’ll spend the next three years trying to answer.